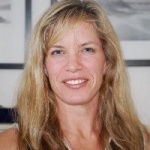 PGIAA proudly features Alumni Profiles toward sharing stories of the Pacifica experience. 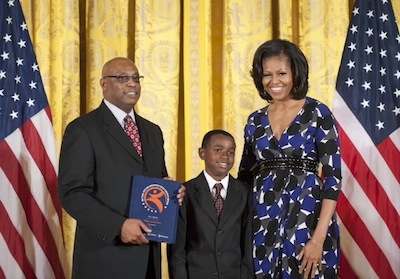 Kwame Scruggs, Ph.D. (Mythological Studies, 2009) accepted a National Arts and Humanities Youth Program Award from First Lady Michelle Obama at the White House on 19 November 2012 for his work using myths and drumming to empower urban youth. The morning of the awards ceremony, Scruggs spoke with Eugene Ahn (M.A. Engaged Humanities, 2010) to share his thoughts on the honor and on his work. So many people ask you, that you start to question yourself: what are you going to do with a degree in myth? And I remember after my first year, I was on the plane riding back [from Pacifica], taking a redeye, and the question was no longer, “What would I do with a degree in myth?” The question became, “What wouldn’t I do with a degree in myth. Myth comes to The White House | Dr. Kwame Scruggs, Dashawn Lamar Felton, and First Lady Michelle Obama pose at the White House on 19 November 2012 after acceptance of the 2012 National Arts and Humanities Youth Program Award, the nation’s highest honor for community-based arts and humanities programs. Obama presented the award to Scruggs and Felton, respectively founder and student in the Ohio-based nonprofit Alchemy Inc., which uses mythological storytelling, drumming, and mentorship to assist urban adolescent males develop a sense of life purpose. It’s such a significant recognition of your work, and of the application of myth in contemporary society. What’s going on for you right now as you await the start of the awards ceremony? Are there any myths or stories coming to you at the moment? [laughter] We brought three of our youth with us — two sixth graders and one of our college students. One will accept the award with me. On the plane ride from Ohio to Washington, D.C., I asked him about his favorite myth. He said “The Hunter and the Boa Constrictor,” and I asked him why. Because in that myth, the hunter sets his traps high and low, near and far, and he catches nothing. At the last minute, he’s about to give up. When he goes to gather all his traps, in that last trap he finds a boa constrictor. Last night, that’s the myth that stood out for me. I’ve been at this work for a while. I’ve been self-employed for 15 years. I’ve had Alchemy for eight. About a year and a half ago, once we had our first core group of students graduate — we had them for about seven years — once they graduated and went to college, I thought maybe this is where I throw in the towel. It’s stressful trying to keep an organization going year-to-year. The fact that we have been honored by this award is major. It’s like finding you’ve been blessed with something after you’ve thought you haven’t caught anything, just like in the myth. So that’s the myth that stands out at the moment. Now tomorrow, it might be something different. For those who aren’t familiar about your work, can you talk a little bit about this journey you’ve been on that now, today, includes this visit to the White House? You’ve done some really incredible things with myth and storytelling? I’m 54 years old right now. It started when I was 38 years old. I was reading Joseph Campbell’s Power of Myth, and his one sentence — “follow your bliss” — just had me: When you follow your bliss, doors open where you thought there’d be no doors. I was staring out my office window at University of Akron. I had a cool job. I asked myself, “What is my bliss?” I asked myself, “What was it I really wanted to do?” Not what could I do. What did I want to do? And my exact words to myself at 38 were: “I want to play my drum and I want to tell mythological stories.” This was in ’96 or ’97. The internet had just come out. I asked my secretary to see if she could find anything with drums and myth. The internet had just come out, so nothing came up. So I forgot about it all. Within a month, a friend came in and threw a magazine on my desk and his exact words were, “Kwame, there’s an interesting article and ad in there.” I flipped through it and saw Pacifica Graduate Institute. I remember getting on the speakerphone. It was in California and I was in Akron. I was married with a four-year-old son. I asked them to send me a catalog. I just wanted to see what kind of classes someone would take to get a degree in mythological studies. They sent me that, and I had that catalog in my hands literally for about three days, going to bed with it and everything. I was working at the University of Akron, using myth with youth and parents, so they paid for me to come out to Pacifica for the Archetypal Psychology conference. I met with some people, and while I was sitting in a room and I was by myself this spirit came and told me, “This is where you need to be.” After about a year and a half of trying to convince myself to fly back and forth to get a degree in myth, I made a decision. I started school and I left my job. About a year after that, I started getting contracts in a few schools and then, what, eight years ago started Alchemy. 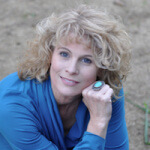 I started Alchemy when I was doing contracts in certain schools, and I realized, “I have no need in me for a middleman; I can go ahead and start my own nonprofit.” That’s how I started Alchemy. I like to say I had no vision at that time, but I have one now. Alchemy is the perfect metaphor for our programs. You know how the alchemists worked with a base metal that most people thought was of little or no value, and when they put it through their process they’d extract gold out of it? We use that as a metaphor, and the urban male society pretty much throws them away. We’re like the alchemists. The process involves myth and fairy tales and the drumming, and that’s how we extract the gold out of the boys for them to hold and see their value. It’s an extraordinary metaphor to be working within an urban setting. People tend to associate alchemy with outdated ideas that no longer have relevance in our society. But you’ve figured out a way. Trust me, people thought I was nuts. Get a degree in mythology, and then name the program “Alchemy.” It’s been a struggle. But I feel like things are about to change. There’s a great TED video on YouTube — “Becoming the Hero Within Your Own Stories” — where you explain your method, and you even take the audience into an experience where you drum out a myth. What kind of reactions do you see from people when they experience your way of using myth to make contact with the things that are important to them? We have yet to disappoint, but I don’t necessarily look at it as my way. I got that idea from Michael Meade. It pretty much started when I read Michael Meade’s book Men and the Water of Life. I read that book four-and-a-half times, gave it to over a hundred people. It’s Michael Meade’s book that really got me started using myth with urban males. Wherever we go, the youth just love it. They really love myths because you can relate it to everything. It’s these myths, in the hands of people who care about kids, that make the program a success. Alchemy’s gift is in how it brings these things together for the kids, how it brings myth and mentors together to help youth find their way. You’ve worked with kids for a long time, haven’t you? About the last 20 years. What called you to work with kids? There have been a number of influences. My father, he ran a neighborhood youth program for a while, for about 30 years. When I was young, I grew up in an all-black neighborhood. I remember the images on TV of blacks as butlers and slaves. My work, in contrast, is about seeing your own heroic nature. I’ve looked at your Alchemy website and see you’ve had some really incredible success stories. The way you get kids to work with myth seems to give myth an important backbone or foundational role in the process of growing up. One thing unique about our program is that we try to stay with the youth for at least three years. Our core group of boys, there are now about 30 of them. Of those 30, half of them started with us when they were in sixth grade. They’re now in second year of college. The other half started with us in ninth grade, and they’re now in second year of college. So, 27 of our 30 boys, they graduated on time, with I think 25 of them going to college. I guess you could say the program offers a kind of a backbone for them, because they do things like journal. They’ve had their journals for four to seven years, and we use them a lot. I remember when I was a student at Pacifica and I felt so blessed to sit at the feet of renowned scholars in their respective fields. I remember coming home one of my first trips and saying, “Wow, this is what my boys need to be exposed to.” I couldn’t bring my boys out to California, so I brought Pacifica to my boys, through Alchemy. Michael Meade has worked with our boys on four separate occasions for four years. Others from Pacifica, too: Dennis Slattery, Neora Myrow, Safron Rossi. We’ve been blessed. You’ve been supported by Pacifica and its community. Oh, yeah. When Dennis was here he was really impressed with the program. He set up an appointment for me to talk with Steve Aizenstat. I was telling him, with all due respect to my wife and son, Pacifica was the best thing that ever happened to me. Life changing. Tell me about what’s happening today. How does this recognition figure into the future of the program, of Alchemy? We want to bring a new level of focus to our three core areas. One, I want to keep my core group, the ones in college. I want to see them through, to graduate from college. The second focus is mentoring college students in various cities. Third is training for teachers and counselors on how to use myth. We’re putting together curriculum for that. That’s my vision for right now. The kids who’ve traveled with you to D.C., they must be really thrilled. Oh, yeah, they’re enjoying this. They’ve been representing Alchemy. One of the boys, at breakfast events yesterday and today, he’s been explaining alchemy to people. This little 12-year-old boy is explaining alchemy as a process of transformation and how the tradition involves working with base metal and extracting gold, and how we use it as a metaphor. [laughter] He’ll be able to accept the award with me today. Then we have another student who can attend in the audience. Our college student is also with us. They only allow one student to attend and accept the award. We managed to get another student in. Thank you. Just like in myth, the hero never accomplishes the task alone. I’ve had so much help. I’m so blessed, Eugene. I’m holding back tears. I thank Pacifica, like I said. My wife, too. They had an article in the paper yesterday talking about the award and my wife sent me an email, and all she said was, “I cried.” I just thank her for being there for me for the 20 years and for not making me feel guilty about traveling back and forth to go to school out there in California in particular — that was for three years I did that. Because without Pacifica, this wouldn’t be happening. That’s a story all Pacifica alumni and students will relate to. It’s such a unique place and my advice to students is just enjoy it while you’re there. I remember people kept asking me what was I going to do with a degree in myth, blah blah blah. So many people ask you, that you start to question yourself: what are you going to do with a degree in myth? And I remember after my first year, I was on the plane riding back, taking a redeye, and the question was no longer, “What would I do with a degree in myth?” The question became, “What wouldn’t I do with a degree in myth?” So there you go. There’s my closer. I am very happy that such a wonderful person received the Wendy Davee Award for service. She was an important member of my family, and this is an appropriate way to remember her! Wonderful man doing wonderful work. Much love, Kwame! Great article and great award! 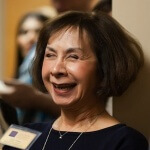 I would love to do the Ph.D. in myth at Pacifica. In fact, I have researched numerious other programs and none are nearly as interesting to me as the Pacifica myth program. The thing is, I’m not sure how to afford it. It seems to cost much more than many other doctoral programs. If I could figure out how to afford it, I will apply.